Don’t let the calendar fool you—we still have a few more weeks of summer left! (And honestly, depending on where you live, you may have a few more months of summer left!) Despite the fact that Pumpkin Spice Lattes are back in coffee shops, I’m still livin’ my summer life and enjoying all the pool trips and flip-flop days I can handle. It will be time for apple desserts soon enough…for now, let’s embrace ice cream while we still can. 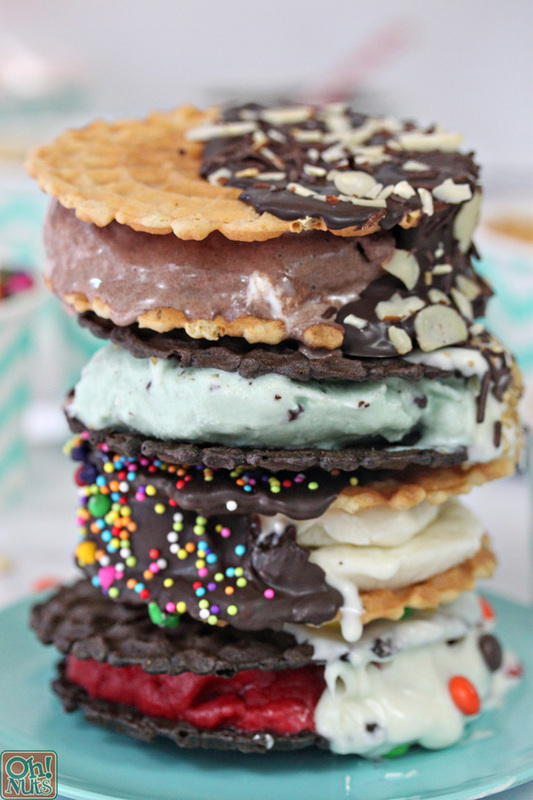 Here’s a surefire way to send summer out with a bang: throw an end of summer ice cream sandwich party! I LOVE buffet -style dessert parties, because everyone is guaranteed to end up with food that they love! When you give your guests lots of choices, they’re able to customize their own food to their hearts’ content, and everyone walks away happy. Plus, how amazing does it look when all of the party food is arranged together in a big display?! Despite all my talk above about summer, this really is a concept that works year-round. 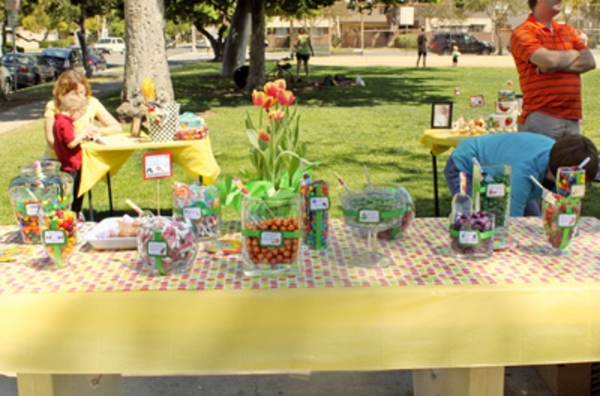 Use this idea for birthday parties, baby or bridal showers, or sports team parties. 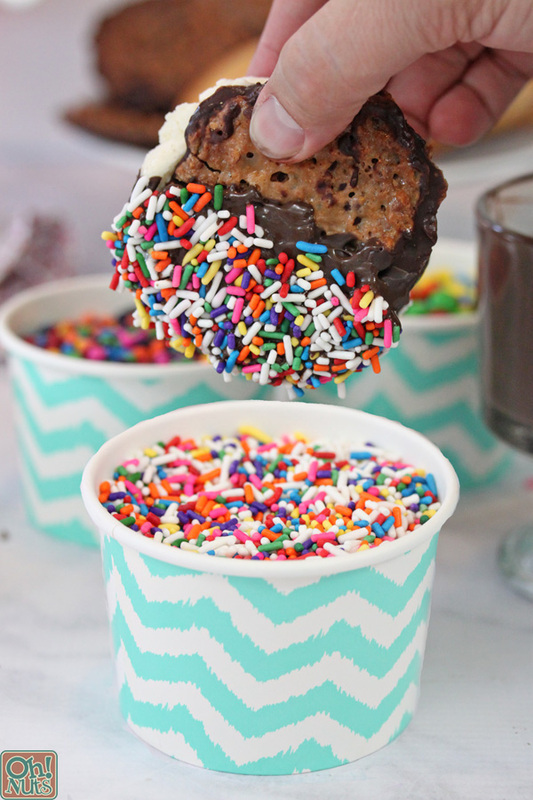 In my experience, no one ever turns down ice cream–especially when it comes with cookies, chocolate, and lots of sprinkles! 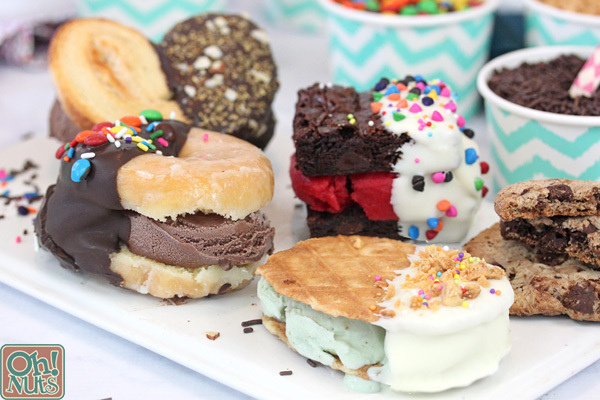 So here are my tips and tricks for hosting an amazing Ice Cream Sandwich Bar. Keep reading for suggestions, lots of drool-worthy pictures, and links to ingredients! You’ll need some ice cream (duh!). I recommend providing several different types—go for standards like vanilla and chocolate, throw in a few fun flavors like cookie and cream or mint chip, and don’t forget to include a sorbet or too in case you have guests who don’t eat dairy! How much you need will depend on how many guests you have and what their ages are (and what other food you might be serving)–but a conservative estimate would be 1 quart for every 5-6 people. If it’s a small party, buy a few pints instead of quarts, so you can still have some flavor variety. And by “cookies,” I really mean “sweet things that can sandwich a scoop of ice cream.” Because you definitely do not need to—and SHOULD not want to—limit yourself to just cookies! I went a little crazy in the bakery when I was shopping for this party, and had so much fun choosing the sweets I wanted to use! 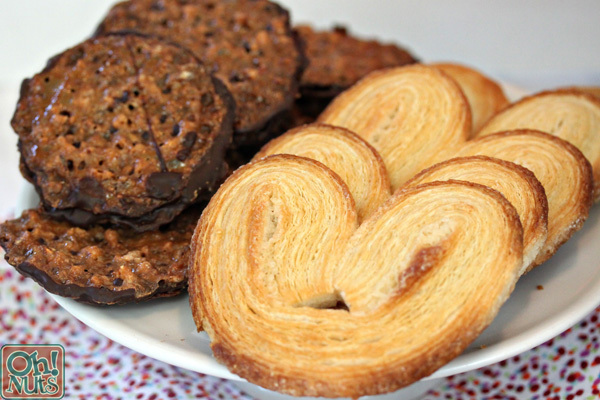 Doughnuts, brownies, palmiers, and waffle cookies joined my more standard choices like chocolate chip cookies and florentines. Anything that is sturdy enough to hold ice cream and not get immediately soggy is fair game, so be creative! Provide at least a few choices so people can mix and match different ice cream and pastry combinations. If some of these choices seem like too much, you can just limit it to cookies, but if you do that, consider having a wide variety of flavors—oatmeal, sugar cookies, ginger cookies, snickerdoodles, etc. Giving people lots of options makes the assembly process more fun. 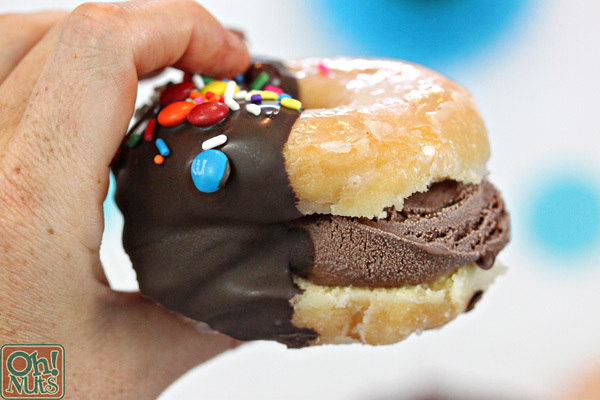 Now, I suppose the chocolate coating on the ice cream sandwiches is technically optional. But have you ever met a dessert that WASN’T improved by more chocolate?? That’s what I thought! For this party, I melted both chocolate and white chocolate, and had the bowls of melted chocolate on hand for easy dunking. If you have mini crock pots or fondue pots, those are a great choice for keeping the chocolate warm and fluid all throughout the party. 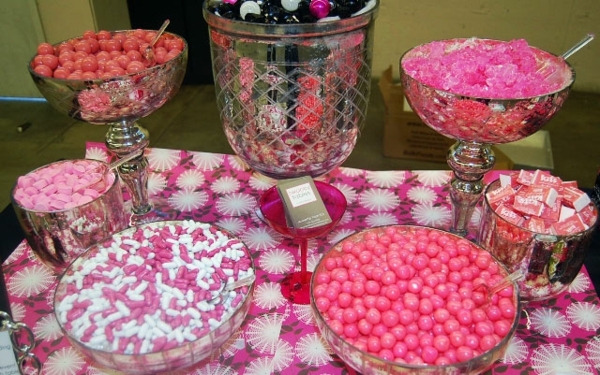 There are also a lot of great flavored chocolates out there (orange and raspberry are two of my favorites) so you can get creative with choices in this area, as well. 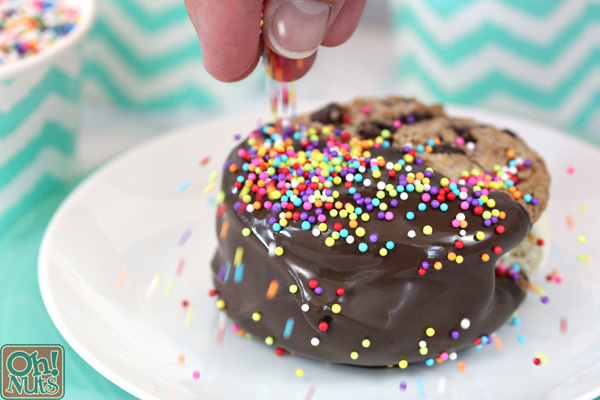 Finally, for the finishing touch…sprinkles, sprinkles, and more SPRINKLES! 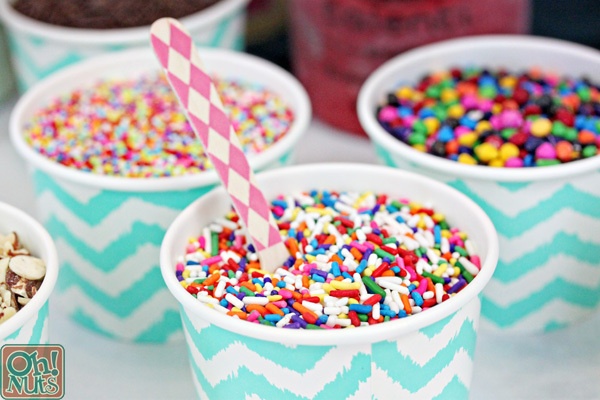 You can never have too many sprinkles! They might not add the most flavor, but they definitely do a lot to make desserts seem celebratory and fun. 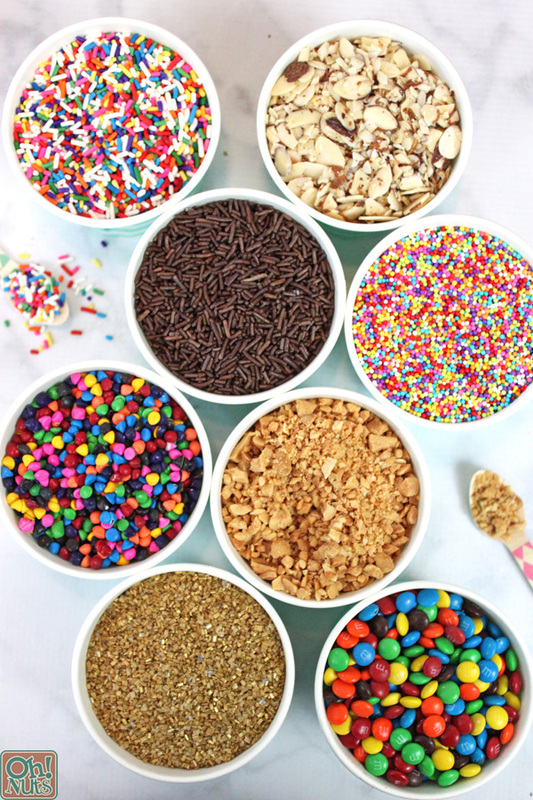 I recommend having a bunch of different sizes, shapes, and colors of sprinkles so people can really go crazy. 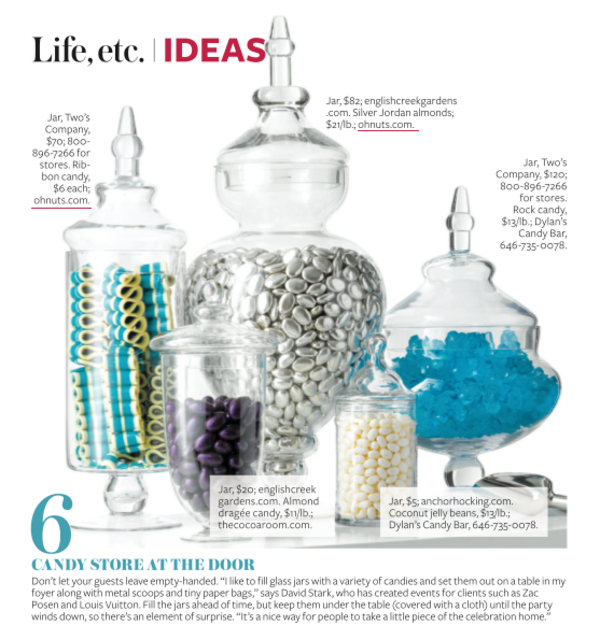 Don’t overlook other fun add-ons too, like small candies, shredded coconut, or chopped nuts. To keep the ice cream from melting during the party, put the cartons in a big bucket of ice, or line a container with a layer of dry ice and put the cartons on top of the dry ice. 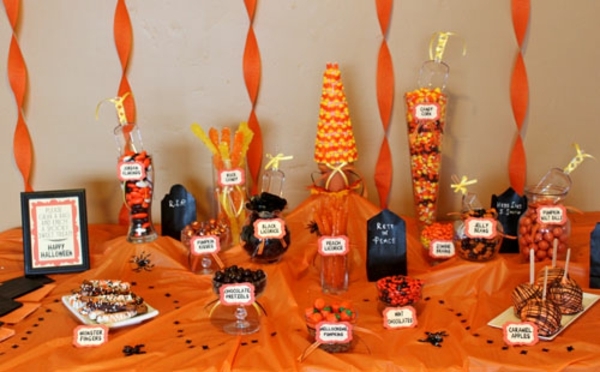 Have multiples of utensils and common ingredients, like ice cream scoops and bowls of melted chocolate so that the lines for the buffet don’t get held up. Don’t forget your vegan, gluten-free, or dairy-free friends! Every component doesn’t have to comply with a special diet, but making sure that everyone is accomodated in some way is part of being a good host. 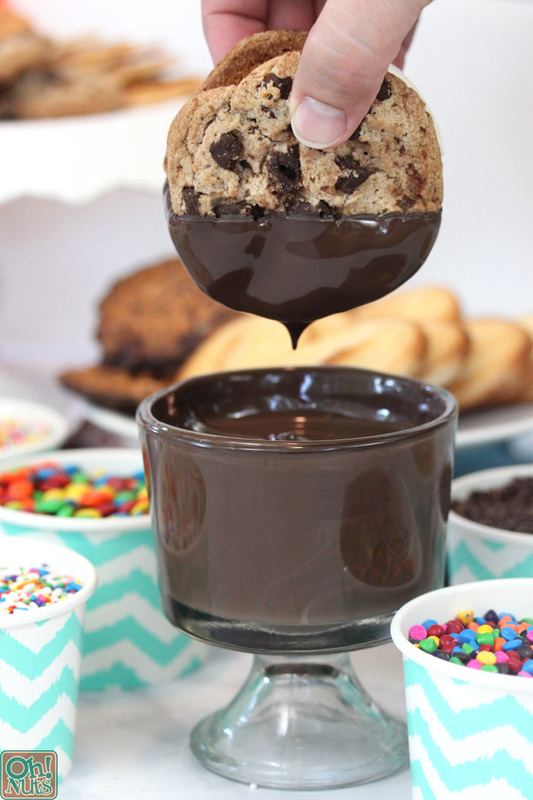 Keep the melted chocolate warm by holding it in small crock pots or fondue pots set to low heat. If you don’t have any, thrift stores are a good source for cheap fondue pots! Depending on what you use to sandwich the ice cream, you might want to consider warming it up a little bit. Warm cookies around cold ice cream is AMAZING. This won’t work for every ingredient, but give it a try with some cookies if you have a microwave handy! Napkins, napkins, napkins! I’ll say it again: napkins. 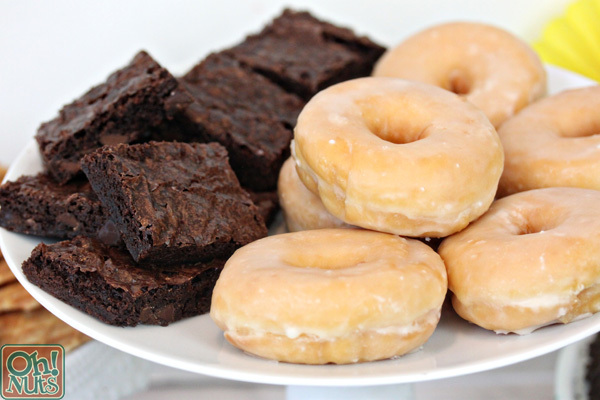 If you want to make it easier on yourself, have people bring their favorite toppings! It can be sort of like an ice cream pot luck. The element of chance and random combinations that result make this a really fun thing. You’ll never know that you love gummy bears and black sesame seeds on your pistachio ice cream sandwich until you try it! 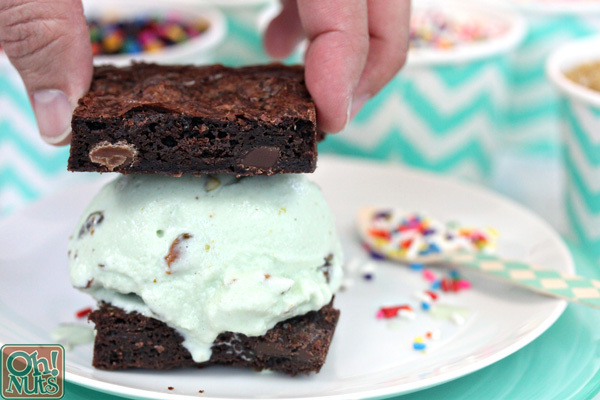 If you do have an ice cream sandwich bar, we want to see it! 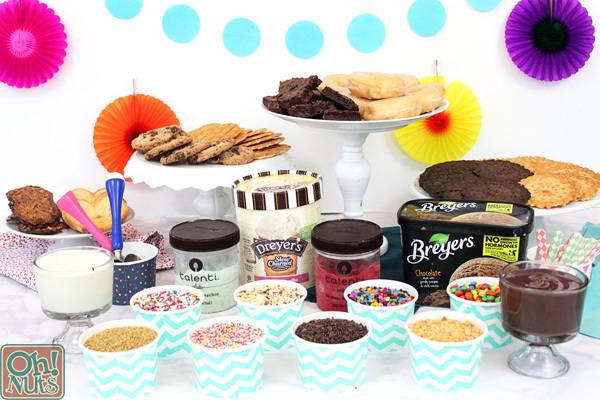 Tag us on Facebook or Instagram so we can swoon over your ice cream party! And be sure to pin this post and share it with friends!